I confess that the President is making me awfully nervous. I can see that he’s making every conceivable effort to work with the Donks, offering every incentive to budget a few billion for the wall in order to open up the government again. He’s put a lot of things on the table that absolutely horrified me, a deal on DACA for one. But Nancy and the Destructocrats just wouldn’t have it. Now we have this weird three week stopgap measure to give these government workers their back pay and the Congress the opportunity to screw it up again. Then there’s the State of the Union address. Nancy withdraws his invitation to enter Congress’ chambers to deliver the address to the nation. Now, granted, all the Constitution requires is that the President make an annual report to Congress. In the good old days before Woodrow Wilson’s presidency that was a written report he send over from the Oval Office, but since then it has become this grand circus. I’d be just as happy if it went back to being just exactly that. I’d rather just read it the next day and skip having to watch all those people grandstanding for the cameras. 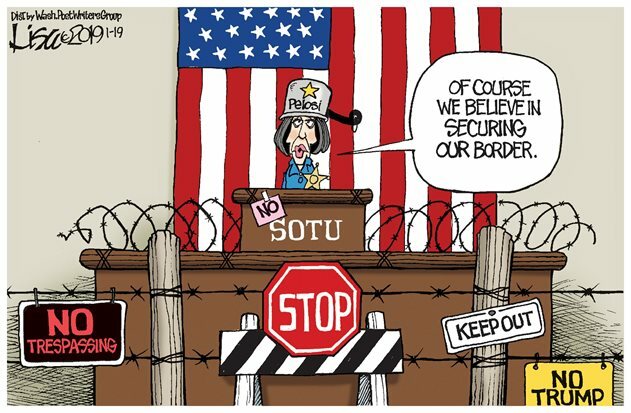 Pelosi’s refusal of permission had nothing to do with the ability to provide security during the shutdown, she just didn’t want President Trump to make his case for the wall directly to the American people. Sure, the Dems get a rebuttal, but seriously, who watches the rebuttal? Nancy knows this. I was hoping that Trump would give the address directly from the Oval Office and bypass Congress entirely, let them watch it on TV just like the rest of us do. That way he doesn’t have to provide them with a written copy in advance and he can leave them gasping and floundering just as he did the last time he addressed the Nation. Oh, and I just loved the way he cut short Nancy’s junket, sending the letter just as the bus to the Air Force base gets moving. What exquisite timing! And suggesting she fly commercial, makes me laugh even now. There were to be six or seven Congress critters on that flight, both Donk and RINO, and a total of 93 people on the flight, the difference being made up of family, friends and staff, all to be paid for by US taxpayers. 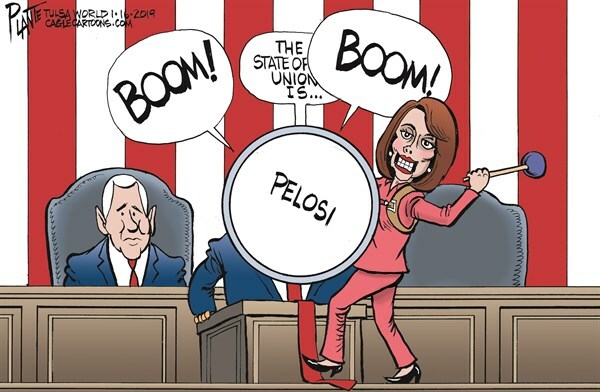 So now that Trump has at least temporarily caved, Nancy still won’t schedule the SOTU. My, my, isn’t she just in the catbird seat now? Whatever else she’s done she’s shown herself to be what we knew her to be all along, a nasty little bee eye tee cee aich. She’s flexing her muscles here, trying to play power games with the President, and everybody knows it is a power play, and thoroughly despicable and dishonorable. Are you sure you want to do that, Nace? Seriously? Play power games with Trump? OK, then, but you’ve been warned. Now we have this three week respite from shutdown mania and I’m nervous. I think Trump put too much on the table, undermining the argument for the wall by being willing to be so conciliatory. 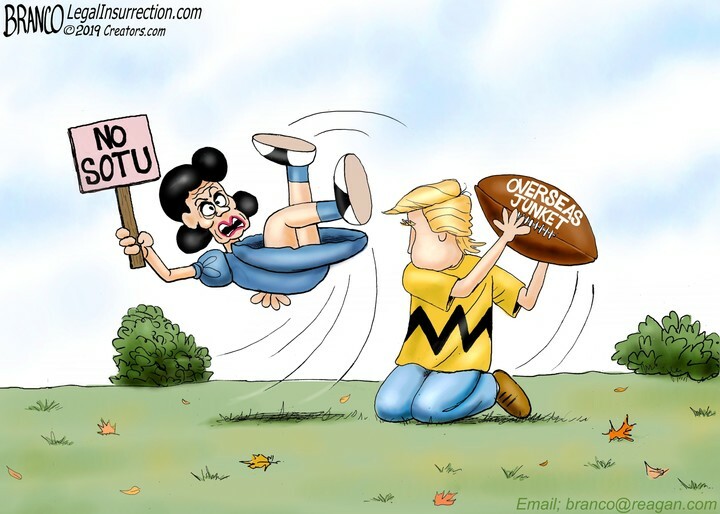 I’m hoping that in the meantime the Demoncrats get so ebullient over their “victory” in “forcing” Trump to cave that they will become even more stridently intransigent and let their radical leftist freak flag fly. They will concede nothing but on the contrary make even more outrageous demands. It is also likely that the Republicans, who never seem to get proactive about their agenda until there are enough Democrats to stop them, will give up the wall and a whole lot more. What then? Ideally Trump vetoes the bill and we’re back to the shutdown. Ideally he gets it that there is no compromise with the Party of Destruction and pushes back hard, demanding more every time they won’t give him what he asks for. There is a danger in that though, a danger I feared prior to his election but which has been pretty well allayed since. The danger that he would become a man on a white horse, riding rough shod over the Constitution to save the Republic. Historically, and the Founders knew this, republics devolve into dictatorships. A dictatorship is exactly what the Democrats want. 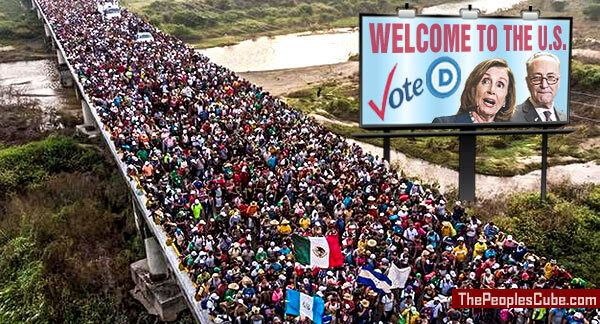 Its what they’ve wanted since 1968. A totalitarian collectivist dictatorship with one their own as Dear Leader. If Trump caves again his presidency will be eviscerated. And so will the country.